The ancient wisdom of Ayurveda offers a brilliant medicinal system that can help us to rebalance our bodies and soul ourselves and thus prevent disease before it manifests. The ayurvedic theory accepts three different bioenergies (doshas) consisting of the elements in microform. Every human being is born with a specific constellation of doshas and elements in their body. In the course of life this balance gets disturbed. The wisdom of Ayurveda helps to re-balance the body-mind system by diet and lifestyle recommendations. 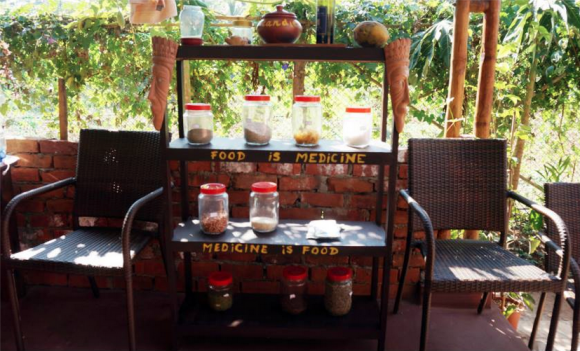 I studied Ayurveda intensively in a clinic in India where I also worked as a therapist. I offer individual nutrition and lifestyle consultations based on the ayurvedic analysis of bodytype and disturbance. Do you want to eat healthier? Learn which foods are at beneficial and balancing for you and when? Let me help you to explore the tastes and effects of the foods. Based on an ayurvedic Prakriti (body type) and Vikriti (imbalances) analysis I work out how you can harmonize your body, mind and emotions with natural wisdom. According to Ayurveda there are seven different body types with specific tendencies. I analyse your body type and give recommendations for nutrition and lifestyle. Looking at currently manifesting tendencies of imbalances, I will introduce possible tools and routines that can help to rebalance yourself. Thereby I combine my knowledge of Ayurveda with other tools that I am experienced with such as yoga, meditation and different cleansing and detox tools.